Catherine Fitzgerald, the author's mother, spent four nights in a hospital after falling in her home. But Medicare refused to pay for her rehab care, saying she had only been an inpatient for one night. So before the Sligo Creek Center would let her through the door, I had to prepay for a month — $12,000 — or nearly $400 a night. Now, my mother had paid into Medicare her entire working life, and since she retired, the Social Security Administration has automatically deducted $130 for her basic Medicare premium from her $1,650 monthly check. On top of that, she pays about $300 a month for a prescription drug plan and supplemental "Medigap" insurance. But because of dueling rules and laws that have been well-known to Medicare officials and members of Congress for years, none of that covered my elderly mother when she needed care. This is a story of how money, outdated laws and federal budget rules can interfere with patient care and leave elderly patients vulnerable. I found my mother lying on the floor of her apartment one evening in early January. I had stopped by because she didn't return my calls. It was Wednesday, and she had fallen sometime in the previous 24 hours. She was awake, but confused. Her lips were chapped, her skin was too pink, and her thick white curls were a mess on her head. I needed help getting her up and into bed. When my husband and I couldn't do it, we called the local fire department. There were no obvious injuries and she was speaking coherently, so I spent the night with her and tried to care for her the next day, thinking she just needed rest and food. But it soon became clear she needed medical help. She couldn't walk, couldn't even move her left leg. Her confusion was getting worse. Her doctor recommended I take her to the emergency room at Holy Cross Hospital in Silver Spring. An ER doctor there examined her, saw that she couldn't move her leg, couldn't really even hold her body upright and had trouble with her memory. He said he would admit her to the hospital's observation unit to figure out what was going on. He mentioned she might need rehab care to get up and walking again. The word observation triggered an alarm deep in my brain. I had read that patients on observation status sometimes weren't eligible for rehab care, and I told the doctor that I was concerned. He said he and the hospital "do all they can to be sure their patients' care is covered." I was reassured. My mother spent four nights at Holy Cross. She was on IV antibiotics for an infection. She got nine X-rays, two MRIs, scans of her carotid arteries and lungs, and a CT scan. Hospital staffers drew blood no less than six times because they were concerned she might have had a mild heart attack or stroke that had caused her to fall. On the day they decided to release her, a social worker named Jay called to say the doctors were recommending she go to an inpatient rehab center — and then he said Medicare wouldn't pay for it. My mother was caught in an administrative wonderland where she slept at a hospital for four nights, but the paperwork said she was an inpatient only one of those nights. Medicare's rules, dating back to the 1960s, require people to spend three nights in a hospital before the federal program will pay for inpatient rehabilitative care. It would cost upward of $12,000 a month, Jay told me. I sped to the hospital in a rage. I demanded to know why they were releasing her when she still couldn't walk. Further, I wanted to know, why were they calling her an "outpatient" when she was sleeping in their bed, under their blankets, wearing their hospital gown and being cared for by their staff. Here were some of the things a parade of social workers and nurses told me that day. The doctor couldn't admit her as an inpatient because she didn't have a qualifying diagnosis. Her status was changed from observation to inpatient on the third day because Medicare requires that. They could not change her status to inpatient for the entire stay because they didn't want to be audited. She couldn't go to acute rehabilitation, which Medicare pays for, because there was no evidence she had had a stroke or heart attack. They didn't say much about her medical care. It was all about the rules. For the record, my mother has no money. She lives on Social Security. She has no car, no house, no savings. My siblings and I help pay her bills. And now they were saying she had to leave the hospital. But she obviously couldn't go home. Holy Cross kept her one more night — at no charge — while we figured out where she could go. They said she could apply for Medicaid, and a social worker handed me a 17-page application. I picked a handful of rehab centers from a list, after a quick search of reviews on my iPhone. One was full, one rejected her because she was listed as "Medicaid pending," and finally, Genesis Healthcare said they would take her — on the condition that I come by with a $12,000 check that day. So now I was out $12,000 — borrowed from a home equity line of credit — and I wanted to know why. Medicare, in its zillions of pages of guidelines and regulations, has two competing rules. The first says patients must spend three nights as a hospital inpatient to qualify for inpatient rehabilitation or skilled nursing care once they're discharged. The second encourages hospitals to keep patients on observation status or risk being audited. The reason? Medicare pays more for short inpatient stays than short outpatient stays. But once a patient has been at the hospital for a number of days, that calculus flips, and outpatients end up costing more. So in its effort to control costs, Medicare forces hospitals to justify their decisions about inpatient and outpatient status. "It was always kind of assumed that when you go to the hospital, people know what hospital care is," says Judy Stein, executive director of the nonprofit Center for Medicare Advocacy. "Hospital admission is when you're admitted to the hospital." Her group is leading a class-action lawsuit against the Department of Health and Human Services, seeking to give patients the right to appeal their status as observation patients. Stein says the use of observation status has grown dramatically in the past decade, in part because Medicare has become far more aggressive in going after hospitals the agency said were inappropriately — and expensively — admitting patients who didn't need hospital care. A study in the journal Health Affairs found that the number of Medicare patients who spent three or more days in a hospital under observation rose 88 percent from 2007 to 2009. That increase came just after Congress authorized Medicare to use contractors to audit hospitals for overcharges. But the trend in observation care has continued. A report by the HHS inspector general found that in fiscal year 2014, more than 633,000 Medicare beneficiaries spent three or more days in the hospital but were considered outpatients, an increase of 8 percent over the previous year. A separate report found that in 2012, about 24,000 patients went to skilled nursing homes or rehab centers and had to pay their own way. Holy Cross built a dedicated observation unit around 2011, according to Yancy Phillips, the hospital's chief quality officer, who spoke to me at length about the use of observation status. That was where my mother spent those four nights. She had her own room, with glass doors that were covered by a curtain. The nurses station was right outside her door. It looks like a cross between a traditional patient floor and the emergency room. Doctors came around at least once a day. Phillips says that Holy Cross has no financial motive to classify patients like my mother one way or another because Maryland law requires the same payment for the same services. It's the only state with such rules. But the hospital still has to follow Medicare's rules when it comes to inpatient and observation care. "There's really no financial advantage to us except if we get the status wrong," he said. "Medicare has come back to us and said, 'No, no, no, this should not have been an inpatient.' "
When that happens, Medicare pays nothing at all. To avoid losing money, Holy Cross, like many other hospitals, uses "decision support" software — in this case a package called InterQual, sold by McKesson — that guides doctors or case managers in making the call on whether a person should be admitted or kept on "observation." The programs are designed to ensure that hospitals don't get dinged by Medicare for overcharging or providing inappropriate services. Phillips says doctors use their own judgment about whether a patient should be admitted. But he also acknowledges that InterQual is embedded in the electronic health record software used at Holy Cross. It was likely this program that concluded that my mother didn't meet Medicare's criteria for inpatient care. The thing about all this is that this problem is well-known to everybody involved. But lawmakers and Medicare haven't taken action to fix it. A bipartisan group of lawmakers, led by Sen. Sherrod Brown, D-Ohio, and Rep. Joe Courtney, D-Conn., have proposed bills multiple times that would simply require Medicare to count all the time patients spend in a hospital toward its requirements for nursing care. The House version attracted 162 co-sponsors from both parties, but neither bill has gotten a hearing on Capitol Hill or been close to a vote. Jonathan Blum, the former Medicare director at CMS, suggests another fix: Get rid of the three-night requirement altogether. "It's really an artifact," he said. "It was put in place as a budgetary control and it was designed when the average length of a hospital stay was seven, eight or nine days." Everyone I talked with agrees that the root of the problem is money. There has been no formal analysis from the Congressional Budget Office, but most people believe that eliminating the three-night requirement would end up costing the government more money. "These are insurance rules. They're policies. They can be changed," says Phillips of Holy Cross Hospital. "But it would have enormous financial implications for the country. And we may have an appetite for tax cuts, but I don't see that we have an appetite for something that would increase Medicare costs." It's not clear that it would cost more, however. Two pilot programs from the late 1970s showed mixed results from eliminating the three-night rule, with Medicare costs rising in Massachusetts, but falling in Oregon, according to an article in JAMA, the Journal of the American Medical Association. That article concluded, however, that the rule may be preventing patients from getting appropriate care. And that would have been the case with my mother, who couldn't have written a $12,000 check to secure a rehab bed for herself. Two weeks into her therapy at the Sligo Center, my mother fell again. 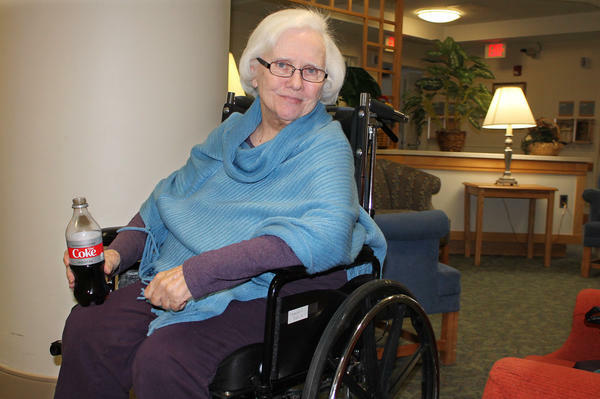 This time, she broke her hip and needed hip replacement surgery. Because she didn't stay the whole month getting rehab care, I got a refund of about $6,000. Under Medicare's rules, that surgery meant she was automatically eligible for post-surgical rehab care. So after she was released from the hospital, she went to a new center — no deposit required.